Yamaha YSS-875EX Soprano SaxophoneYamaha Custom EX sopranos are an improved version of the classic YSS-875, already considered by many to be the finest soprano saxes ever made. The new design with its G2 neck offers even broader expressive capabilities with wide dynamics, precise intonation, and a g..
Yamaha YBS-32 Baritone SaxophonesYamaha's 32 series saxes offer professional qualities at an intermediate price. Much of their design is based upon the more expensive Pro and Custom saxes, and they share many of the same features. The 32 saxes deliver outstanding response, tone, intonation, as well ..
Yamaha YAS-875EX Custom Eb Alto SaxophoneImproved versions of that proven classic the Custom 875, the EX saxes are the result of decades of painstaking reserch and trials involving some of the world's greatest saxophonists. 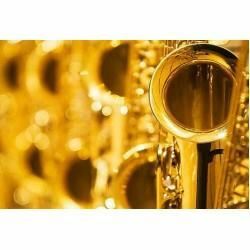 They feature a smooth response and a deep, refined sound full of rich colors..
Yamaha YAS-480 Alto SaxophoneThe YAS/YTS-480 saxophones are a step ahead. With a little bit more resistance, they have an authoritative sound yet a great flexibility due to the separated key guards.Ergonomics, playability and intonation are excellent as you would expect from Yamaha.Based on the popu..
Yamaha YAS-280 Alto SaxophoneThe YAS/YTS-280 saxophones offer a perfect start because they are designed with the young beginner in mind. Relatively light-weight and ergonomically shaped, they are easy to hold and to play. The intonation is perfect, as you would expect from Yamaha, and it is easy to ..
Yamaha Yas-62 Professional Alto SaxophoneAlready a legend, the “62” attained the love and respect of a wide range of players for its highly reliable performance and outstanding quality. It owes its success to a group of dedicated designers with great vision, and highly skilled craftsmen performing t..